Milena Jesenská (10 August 1896 – 17 May 1944) was a Czech journalist, writer, editor and translator. She is popularly remembered as one of Franz Kafka’s great loves, and Jesenská’s translation of The Stoker was the first translation of Kafka’s writings into any foreign language. After the occupation of Czechoslovakia by the German army, Jesenská joined an underground resistance movement and helped many Jewish and political refugees to emigrate. In the Czech Republic, she is remembered as one of the most prominent journalists of the interwar period and as a brave one: in 1939 she was arrested for her work in the resistance after the German occupation of Bohemia and Moravia, and died in Ravensbrück concentration camp in 1944. It is estimated that Jesenská wrote well over 1,000 articles but only a handful have been translated into English. 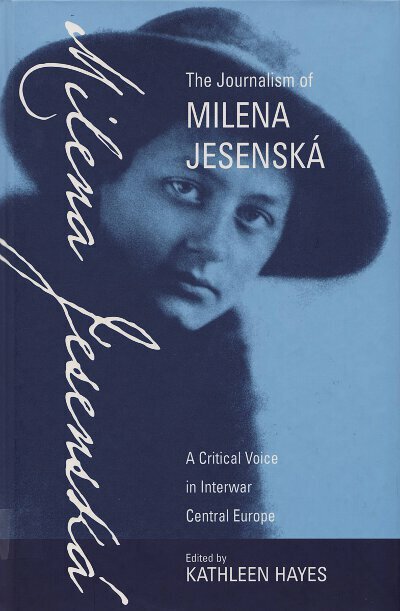 In The Journalism Of Milena Jesenská: A Critical Voice in Interwar Central Europe, her own writings provide a new perspective on her personality, as well as the changes in Central Europe between the two world wars as these were perceived by a woman of letters. The articles in this volume cover a wide range of topics, including her perceptions of Kafka, her understanding of social and cultural changes during this period, the threat of Nazism, and the plight of the Jews in the 1930s. On 15 March 1939, the German Wehrmacht moved into Prague, and the occupation would not end until the surrender of Germany following World War II. Below is an excerpt from the book The Journalism Of Milena Jesenská: A Critical Voice in Interwar Central Europe. How do great events happen? Unexpectedly and all at once. But when they are upon us, we always find that we are not surprised. A person always has some apprehension and knowledge of things to come, only deafened by reason, will, desire, fear, haste and work. As soon as the soul of a person remains for a moment naked and stripped of everything else except its secret intuition, it is sure at once: I knew it. There is a reason why so many people go about today and say: I suspected as much; I said so. I believe them. We all suspected as much and if we had listened attentively to the voice of our hearts when we sat at home alone, for instance, or when we woke up tired at dawn, if we had been able to clothe in words the feelings, which are true and not only the thoughts, which are often distorted, we would have said: we are waiting for it. But the logic of things is, at the same time, illogical. Every person awaits some kind of remarkable event in life: good fortune, poverty, illness, hunger, death. When it comes, however, he does not recognise it. All he knows is that it has overwhelmed him completely, not leaving him the time or the opportunity to act. When the telephone rang at four in the morning on Tuesday, when friends and acquaintances called, when Czech Radio began to broadcast, the city under our windows looked the same as it had on every other night. The lights under the windows made the same configuration, the crossroads made the same cross. From three o’clock on, however, lights began to flick on gradually: in the neighbouring apartments, across the way, down below, up above, then all over the street. We stood at the window and said to ourselves: they know by now. We woke people up with a telephone call: do you know? They answered: yes. That sullen daybreak over the roofs, the pale moon below the clouds, the sleepless faces, the mug of hot coffee and the regular reports on the radio.51 That is how great events come to people: quietly and without warning. In the German newspapers there was a story about the German soldiers who drove to Prague: a quiet city in a pre-spring dawn, a line of German vehicles and in them men with beating hearts: what will it be like inside the city? How will people behave in these foreign streets? In the suburbs, they stop the first pedestrian, a labourer on his way to work. They realise at first glance that he knows everything. He behaves calmly; quietly and peacefully he points the way. As always when great events are taking place, Czechs behave wonderfully. Thanks are due to Czech Radio for its concise objectivity, reporting patiently every five minutes without fail: the German army is proceeding from the borders to Prague. Act calmly. Go to work. Send your children to school. At half past seven in the morning, a crowd of children set out on the way to school, as usual. Workers and clerks drove off to work, as usual. The trams were full, as usual. Only the people were different. They stood and kept silent. I had never heard so many people keep silent before. There were no crowds in the streets at all. People did not discuss things at all. In the offices, they did not even raise their heads from their desks. I do not know where this unified and consistent behaviour of thousands came from, where this consonant rhythm of many souls, strangers to one another, sprang from all of a sudden: at twenty-five minutes to nine on 15 March 1939, the Reich German army rode up to National Avenue. Crowds of people flocked over the sidewalks, as usual. No one watched, no one turned around.52 The German residents of Prague welcomed the Reich soldiers. They likewise behaved politely towards us. It is altogether strange how things change when a unit breaks down into individuals and one person stands before another. In Wenceslas Square, a Czech girl came across a group of German soldiers – and because by then it was the second day, because by then all of us had nerves that were a little frayed and because only on the second day does a person come to understand better and think more – tears ran down her cheeks. Then something strange happened. A German soldier walked up to her, a simple, ordinary soldier and said: Aber Fräulein, wir können doch nichts dafür…!53 He said it as if he were comforting a small child. He had a freckled German face, reddish hair and a German uniform; otherwise he was in no way different from a Czech private, a simple man, devoted to his homeland. So two people stood there, facing one another, ‘und konnten nichts dafür….’54 In that simple, terribly ordinary sentence is the key to everything. You see, there are moments when a person would like to walk up to a German officer and say to him: thank you, Sir. A few days ago I was speaking with a German, a national socialist, of course. He spoke at length and very sensibly about the position of the Czechs and the advantages, which we had acquired, according to him and the disadvantages, which he himself acknowledged. All this is not very interesting because today everything is in a state of change and even well informed people can give no more than an opinion. What is interesting, however, is his opinion of the Czechs. He asked me almost shyly: why is it that so many Czechs come to us and utter the greeting ‘Heil Hitler’? Czechs? That must be a mistake. It is not a mistake. They come to our office, raise their right arms and say ‘Heil Hitler’. Why? I could tell you about one writer who is doing all he can – already and in haste – to get his plays performed on a Berlin stage. I could tell you about a lot of people who are doing more than they have to, zealously, breathlessly. You know, every German understands national pride and national backbone. Servile behaviour provokes only an ironical smile in the German of today, believe me. In two days’ time, the image of the city has changed beyond recognition.55 In the bars there are men wearing uniforms that we do not even recognise from pictures. They drive vehicles that we have never seen before through the streets. They drive here and they drive there; they always know what they are supposed to do; they act decisively and purposefully. In the bookstores they buy maps of Prague and French and English books. Crowds of soldiers walk through the streets; they stop in front of shop-windows, look about, chat. Meanwhile, not a single cog-wheel has stopped, not a single pen or a single machine. I saw a German soldier walk past behind the crowd, stop and salute.57 He looked at the eyes red with crying, at the teardrops, at the snow-covered mountains of snowdrops; he saw people who were crying because he was there. And he saluted. Clearly he understood why we were sad. Watching him go, I thought about the Grand Illusion: will we ever actually live next to one another – German, Czech, French, Russian, English – without harming one another, without having to hate one another, without perpetrating injustices against one another?58 Will empires one day really understand one another as individual people understand one another? Will the borders between countries one day fall as they do between people? How beautiful it would be to live to see it! 51 News of the occupation was first announced on Radio Prague at 4.30 a.m. on 15 March. Repeated broadcasts warned the population not to resist the German army. See: Vojtech Mastny, The Czechs Under Nazi Rule, London and New York, 1971, p. 45. 52 See the description of the same day by George F. Kennan, who was assigned Secretary to the American Legation at Prague in 1938 and stayed on after the occupation to write political reports: ‘About seven o’clock, I took a ride around town. A full blizzard was blowing, by this time, and the snow was staying on the streets. The downtown section was crowded, partly by the normal early morning traffic of people going to work but partly by people running about and making last-minute preparations of all sorts. The news was widely spread by this time, and many of the women were weeping into their handkerchiefs, as they walked.’ George F. Kennan, From Prague After Munich: Diplomatic Papers 1938–1940, Princeton, 1968, p. 86. 53 But Miss, we can’t help it. 54 They couldn’t help it. 55 Kennan comments in a letter dated 14 April 1939: ‘The outward signs of Nazism are now almost all represented in the Prague scene, from infinite varieties of uniforms to the “Aryan shop” placards on the stores. Perhaps the only phenomenon of Nazi life which Prague has happily been spared is the sight of brutality against Jews in public places.’ Kennan, From Prague After Munich: Diplomatic Papers 1938–1940, p. 114. 56 Sayer writes: ‘One October night that same year , SS men removed the remains of the Unknown Czechoslovak Soldier that had been installed in the chapel of the Old Town Hall in 1922 and threw them into the Vltava downstream of the city at Troja.’ Sayer, The Coasts of Bohemia. A Czech History, p. 233. 57 The commanding Wehrmacht general in Bohemia, Johannes Blaskowitz (1883–1948), ordered his soldiers ‘to give a military salute when passing by the Tomb of the Unknown Soldier in Prague.’ Mastny, The Czechs under Nazi Rule, p. 55. Kennan notes in March 1939: ‘The German soldiers have maintained good discipline and a correct attitude. Their higher officers have done everything in their power, apparently, to placate Czech sensibilities, even to laying wreaths on the tomb of the unknown soldier.’ He comments: ‘All this I attribute not to any excess altruism on the part of the Germans but to a real desire that there should be – for the moment – the maximum of peace, quiet, and good feeling in Bohemia and Moravia.’ Kennan, From Prague After Munich: Diplomatic Papers 1938-1940, p. 103. 58 She refers to the film La Grande Illusion (1937), directed by Jean Renoir (1894–1979). « March is National Nutrition Month!